Do you think that life has more to give to you, but you simply overpass them? Stop chasing money and the things you deserve and start making money chase you. Become A real money magnet, an instant wealth creating machine through my Virtual Coaching Program. By entering to my inner circle program, you will have access to a personal development library of 10.000+ titles! This is more than 1 Terrabyte of disk space and more than a whole year of listening and audio books from every great leader trainer and motivator you can imagine. Let the positive flow of information transform your life and open your mind to them most intensive transformational opportunity! Do l really need a coach? Then you ask yourself: Do l need a coach? If you ask yourself this question, then you are in the top 3% that has the courage to admit it. Success doesn’ t come overnight and a mentor will help you achieve your dreams faster than everyone. Let’s face it, when you are around successful people, you are more likely to be successful yourself. Left to try to figure it out all by yourself, you are more likely to get frustrated and quit before you find the success you desire. I know that I have learned an incredible amount from my mentors, and I love being able to pass on that knowledge to the people on my team. Having a mentor to help you doesn’t guarantee your success…that will be up to you, but if you truly desire to achieve success, I am sure I can help point you in the right direction. I have learned that success is something that you attract to you based on the kind of person you become. It is not something to be chased…it is something you attract to your life. In order to attract it, you must go to work on yourself, and not look to outside forces to change your situation. Once you make a decision that you have to succeed and then find a mentor who can help point you in the right direction, you will be well on your way. If you will help yourself, and also help enough other people get the results they desire, you can achieve the results you desire. 2. Work more efficiently, making your business automated and even work on the auto pilot! 3. Stop jumping from opportunity to opportunity searching for success. Stop being a wussy! If you want to change business, try to be successful in the current business and then leave. 4. Stop chasing uninterested family members and friends. These are old school disruptive marketing techniques that are not for professionals. Have you aver see a doctor chasing clients? By hiring a mentor or a coach or finding one you will learn all of the things above. 4. chasing prospects, friends and everyone you meet to join your opportunity, online or offline. Network marketing or affiliate marketing. Stop for a while, calm down and think for yourself. Do l really want a mentor? Your ego maybe is too high and you need to overcome your fears and your regrets. Make a new start today! if you are not happy with our services, then simply click on the button below. 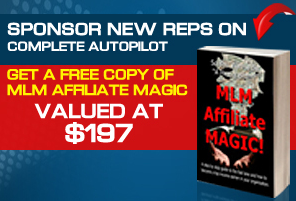 Don’t forget to claim your free copy of MLM Affiliate Magic! One of the best books l read about Attraction Marketing!